fracture was 55%, compared with 6% in those presenting sooner than 48 hours. admission had preoperative venographic evidence of DVT. starts at the time of injury rather than after surgical repair. compression stockings, and venous foot pumps. in 26%, and graded compression stockings in 30%. between aspirin and placebo in the rate of symptomatic VTE. 21 days or until hospital discharge. both was 9% with warfarin, 11% with aspirin, and 30% with placebo. to placebo, shows relative risk reductions of over 60%. every 8 hours) or the low molecular-weight heparin dalteparin (5,000 U daily). statistically significant 50% decrease in the incidence of DVT. 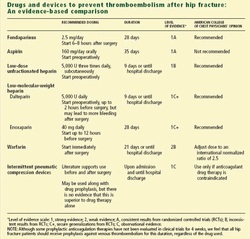 difference in the frequency of DVT or bleeding complications. this influence the timing of surgery? 6 to 8 hours without increasing the risk of epidural hematoma. after the dose is given. hours after surgery to restart it, as was done in PENTHIFRA.